So you’re wondering how fast that new Linux desktop you’ve built is. But you’re not sure how to run a quick benchmark and find out. Maybe you’re not familiar with the programs you should use. Maybe you’ve never actually run a benchmark before! In any case we’ll go over a few basic benchmark tools that’ll have you comparing real world and synthetic performance numbers in no time. hardinfo is fairly straight forward tool to start with (see the debian package information here) . On debian or Ubuntu Linux it might already be installed. 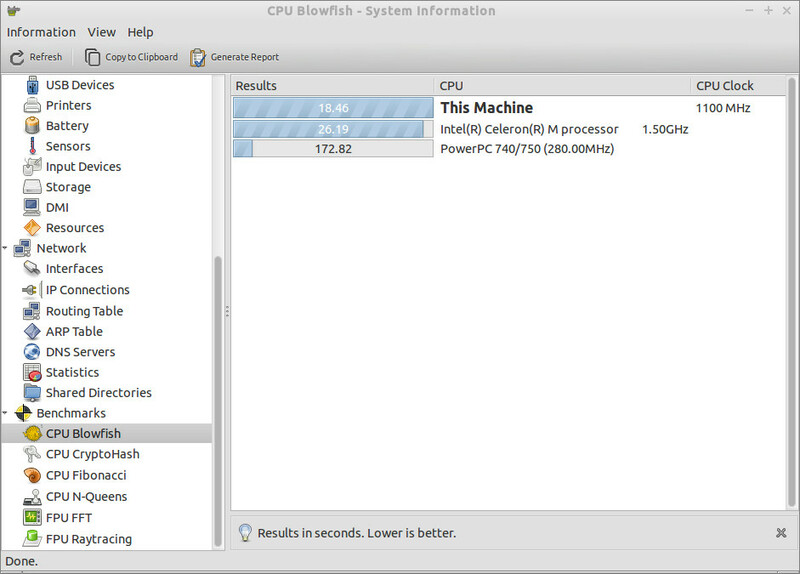 In Ubuntu it will show up as “System profiler and benchmark” in your menuing interface. If not it can be installed with the command “sudo apt-get install hardinfo” or searched for in your favorite software manager. 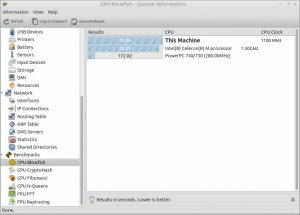 This all-in-one information tool gives you easy access to systems hardware list from the proc and sys psudo-filesystems (which are an article in and of themselves) and a variety of benchmark tools. Unfortunately you can no longer auto-sync with the hardinfo benchmarks database with the closure of BerliOS. But it remains both a good one-page source of system information and a tool for getting a couple of quick number crunching benchmarks run. 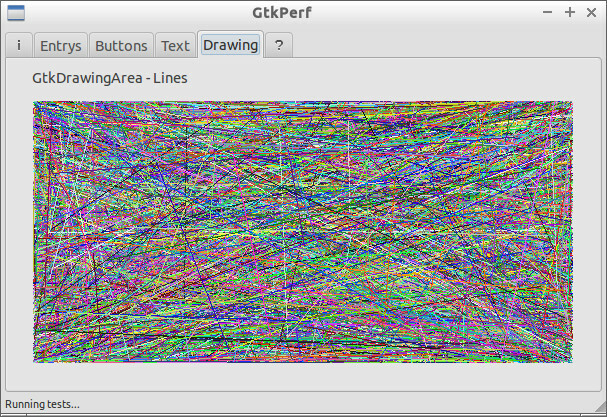 GTKPerf running it’s drawing area test. 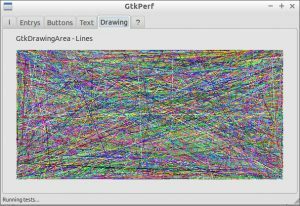 GTKperf is a small test suite that shows you how fast your system handles creating graphics, rendering lines, and scrolling through drop-downs with the GTK user interface speed. To install it search for gtkperf in your package installer or type “sudo apt-get install gtkperf” in a terminal. From it’s creator’s web site: “There exist other performance tools but none to measure GTK+ UI speed. With this tool it can be done easily and repeated (the) same way multiple times“. And that’s exactly what it does. While it’s not going to give you an idea of how massive number crunching will go it should give you some measure of how responsive your desktop will be. Which is about as practical as benchmarks can get. To actually run the default test set in GTKperf click on “Start” under the “i” tab. 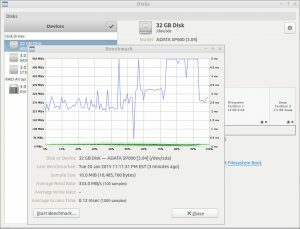 Gnome Disks showing a SDD benchmark. 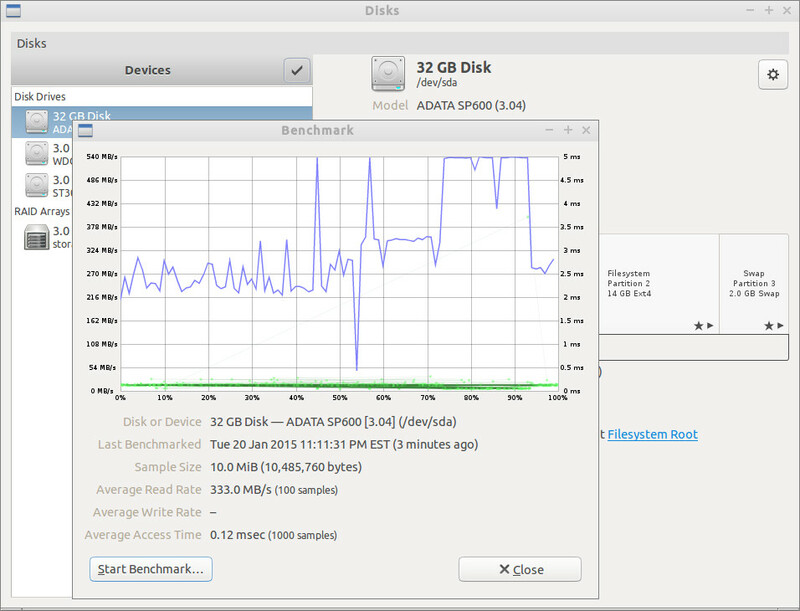 gnome-disks is another application that has benchmarking as a small subset of it’s capabilities. To install gnome-disks on Debian or Ubuntu search for gnome-disk-utility in your package manager or type “sudo apt-get install gnome-disk-utility“. Seasoned Linux veterans will remember this application as the nearly impossible to remember palimpsest software. 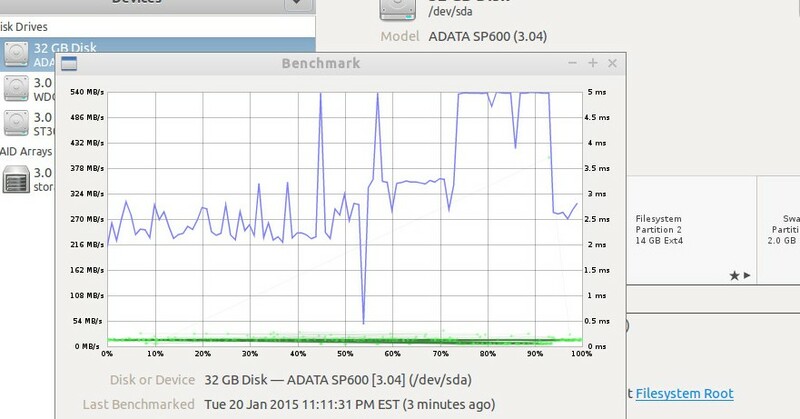 The latest interface isn’t quite as robust, but it still has hard drive speed benchmarking as part of it’s tool set. It will also provide you with information about your hard drives SMART status and access to many of the partition management utilities from a clean graphical interface. On a drive with partitions it’s not recommended to run a write benchmark unless the data is backed up or you don’t mind the possibility of something going wrong and it being destroyed. These benchmarks are better used for drives that don’t currently have data on them that you’re’ getting an initial speed run of and for that gnome-disks gives you a very nice graph of the drive’s speed and latency for your test criteria. To actually reach the benchmark options use the gear symbol when you’ve selected the appropriate drive. Again, this is a tool best used for drives without any data and requires root access to run.